(100 needles/box)* as a gift. 3. With any purchase of 10 boxes of TaiYi Pure Moxa Roll (Extra Pure, 30:1, 10pcs.box), we will include a Single-Hole Bamboo Moxa Box as a gift. 4. With any purchase of 20 boxes of TaiYi Pure Moxa Roll (Extra Pure, 30:1, 10pcs.box), we will include a Two-Hole Bamboo Moxa Box as a gift. 5. With any order purchase of Acupuncture Needles $300 or above, we will include a Magnetic Pick-Up device for your needles. 6. With any order purchase of Acupuncture Needles $1000 or above, we will include a Classic Yellow Emperor Acupuncture Model Set(limited quantities available). 7. With any order purchase of a T.E.N.S. 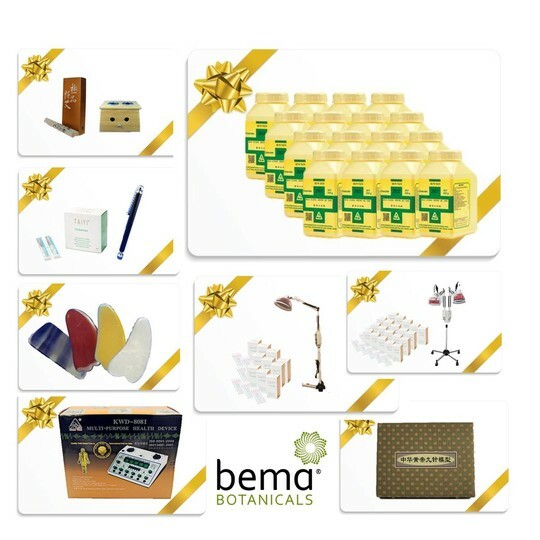 Electrical Acupuncture Stimulator, we will include 5 boxes of TaiYi T1 Acupuncture needles (100 needles/box)* as a gift. 8. With any bottle order purchase of TCM Concentrated Granule $500 or above, we will include free shipping within Greater Vancouver district ( or discounted shipping rate for area outside of Greater Vancouver). * T1 Needles specification based on availability, please email or phone to request available gauge & length.